Today you can find me at T shirt Diaries, I will be not only participating in Robin's crafting challenge "Stash busting September", but I will also be a judge. If you haven't heard about the challenge, then allow me to briefly explain. 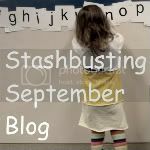 Stashbusting September is a chance for all of us to put that stash of fabric, craft supplies, and collection of things that are waiting to be repurposed to good use. In the month of September you don't buy any new craft supplies and simply use what you have on hand. This is a challenge, and it will be judged (by me and two other fantastic craft bloggers). There is a great prize that goes to the most creative crafter that successfully stashbusts. So hop on over to Robin's blog and show her some love. She is so great at repurposing and upcycling materials at hand. She also hosts a great upcycled link party every Wednesday. If you choose to participate (which you should), then don't forget to link up so that we know you are participating. Pick up her button and post it on your blog. This is a great way to go through what you have and also save some money for the holiday season that is quickly approaching. So head over to your local craft store and pick up whatever basics you need (thread, hot glue, velcro, needles, ect.) and gear up for the challenge.